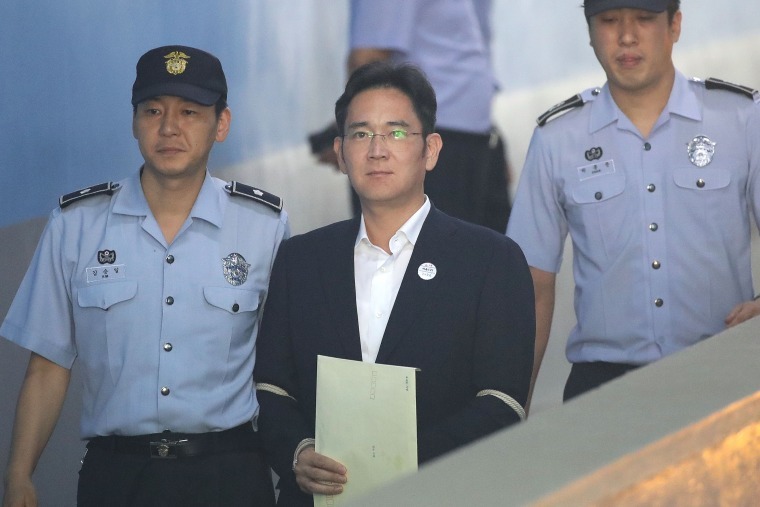 SEOUL, South Korea — A South Korean court sentenced the billionaire chief of Samsung to five years in prison for bribery and other crimes in a stunning downfall for the heir to South Korea's biggest family fortune and a global consumer electronics empire. The Seoul Central District Court said Friday that Lee Jae-yong, 49, was guilty of offering bribes to Park Geun-hye when she was South Korea's president, and to Park's close friend, to get government support for efforts to cement his control over the Samsung empire. The revelations that led to Lee's arrest in February fed public outrage which contributed to Park's removal as president. Lee was accused of offering $38 million in bribes to four entities controlled by Choi Soon-sil, a long-time friend of Park, in exchange for government help with a merger that strengthened Lee's control over Samsung after his father suffered a heart attack in 2014. Samsung has not denied transferring corporate funds. But Lee, vice chairman at Samsung Electronics and the Samsung founder's grandson, claimed innocence during the court hearing. He said he was unaware of the foundations or the donations, which were overseen by other executives. Judges pointed to an unusual arrangement in which Samsung bankrolled equestrian training for Choi's daughter as proof of Lee's knowledge of what was transpiring. They said Lee was aware that Park, president at the time, wanted Samsung to sponsor the equestrian training. Samsung secretively provided a huge amount of money to Choi's Germany-based company that paid for the training and the exorbitantly priced foreign horses worth 3.6 billion won ($3.2 million) were part of the bribes, the verdict said. The attempts to hide Samsung's involvement also constituted crimes, it said. In total, Samsung paid $7.9 million to the German company, the judges said. The ruling in Lee's case can be appealed twice. Samsung will appeal the ruling immediately, Song Woo-cheol, a Samsung attorney, told reporters.